We rallied right up into Wednesday testing the convergence of overhead resistance and will now most likely return to retest support into Friday. 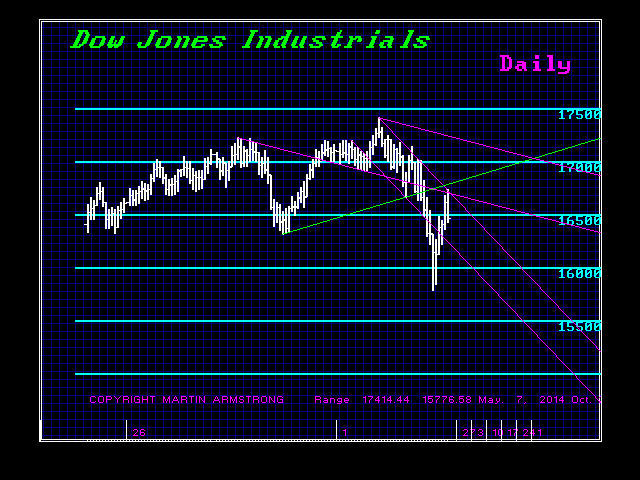 The bulk of resistance stands at the 17000 level and support at 15960. This is the closing range of resistance and support. If this week proves to be the reaction high, then we should see one more new low ahead. This is the timing that seems to be emerging. The rally for stocks seems to be pushed off into the 2017-2018 period for it looks like this 8.6 year wave will be the peak in the bond bubble. After that, interest rates will escalate and we will see a greater number of defaults in various governments. Keep in mind that the amount of capital invested in bonds v equity is about 3:1. Despite all the prognostications of a Great Depression based upon a bubble in stocks, sorry – we ain’t there yet.